Like any living being, when horses age they fall prey to a number of age-related conditions. These can’t be avoided but they can be managed, and caring for an older horse needn’t be a struggle. So, what do we class as a geriatric horse? Typically, we consider a horse to be ‘old’ when it is 19 years and over. But as horses are living longer, just as we are, the geriatric age is increasing, and now it is common to see horses living into their late 20s and 30s. Ponies especially, have a relatively long life expectancy compared to other domestic animals. What do I need to be aware of as my horse ages? One of the things you might notice as your horse enters its golden years is loss of condition and muscle mass. Weight loss will also be evident. It is important that you keep an eye on this and make sure the body condition score of your horse doesn’t fall below 2/5. Horses with low body condition scores have reduced immunity and are less capable of regulating their body temperature in extremes of weather. Quite often weight loss in geriatric horses is the result of dental issues, poor or reduced digestion and absorption of nutrients, hormonal problems and internal diseases. As your ageing horse is at higher risk in these areas, it is vital that you monitor them. Having regular dental exams is one way of doing this – ideally 2-3 times a year, as a minimum. Horses with poor dentition and missing teeth are likely to encounter difficulty eating, as well as pain and discomfort, which will potentially lead to further weight loss. Parasite burdens are also more likely to be a problem in geriatric horses, as reduced immunity may increase the risk of parasitism. Common indications of a parasite burden include poor condition, weight loss, changes to the consistency of stool, and colic. If you are unsure about what to worm and when, we have created a guide on the parasites to treat throughout the seasons, and the chemical to treat them with. Consult your vet or SQP if you are at all unsure. Older horses tend to have a greater incidence of hormonal problems too, including Equine Cushing’s Disease or PPID. 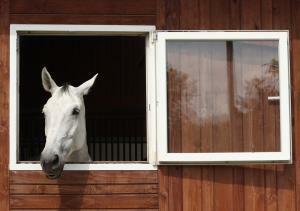 Although this can occur in horses of any age, most cases are seen in horses in their 20s and 30s. Again, this is something to look out for, and consult a vet if you notice a long, curly coat that doesn’t shed normally. Colic and gastric ulceration is also more prevalent in older horses due to reduced immunity, the reduced absorption of nutrients and the presence of systemic diseases. If you notice signs such as reduced appetite, weight loss and poor condition, attitude change, diarrhoea, and lying down more than normal, consult your vet. Alongside these more serious complaints, there are other areas that may be affected in old age, such as hoof, cardiac, respiratory and musculoskeletal health, and problems with the eyes. This is fairly similar to the kinds of complaints seen in older humans too. Overall though, most horses, even geriatric ones, will remain perfectly healthy given the right care. They may require a little bit extra, but they are completely worth it for the quiet companionship they give us in their twilight years. My 15.1hh gelding 'Snoops' is 32 years old, has worked most of his life in stunt and trick riding. He is very intelligent and mischeivious, has slight arthritis behind; the last seven years he has been a happy hacker and very spoilt. This year he is just looking his age with a few grey bits on his face, otherwise he looks glowing, a perfect weight. When ridden his five year old brain kicks in and we have amazing rides. Earlier this year he fell in the woods, he was ok but I broke my arm, my farrier has rolled his shoes and toe, but I still get the feeling he is not picking up his feet properly, the back shoes are becoming very worn after five weeks so he has his feet done every five weeks. His teeht are checked at least twic a year, he diet has changed to mini cubes, he us eating well. A useful yet sensitively written piece! I have 3 native type small horses, 2 of 27 and.1 of 26 years. They are in great health at the moment and still ridden 2 or 3 times a week on pretty decent rides of 1 to 4 hours each time. I'm careful of speed and the going underfoot. However they also enjoy being long-reined along bridleways, field tracks etc. Also we have a lot of fun learning 'tricks', horse agility (ridden or not), being led out for picnics, hair-do's, etc etc, There's lots to do with your elderly equine friends! !